Ahh Lincoln’s second club and therefore, Lincolnshire’s second biggest club :P I have a soft spot in my heart for United despite them irritating me to hell in Football Manager. I used the editor to make them super rich and 12 years into the game, they still haven’t managed to get promoted to a level at which I can assume control under another user and take them too the Prem. 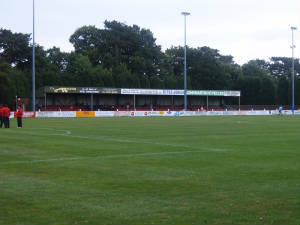 Anyway, Ashby Avenue is situated in Lincoln’s Birchwood area and is an extremely inconvenient place for most people in the City, it takes me at least 40 minutes from my house and considering the only time we ever play them is in the baking summer, that is a LONG walk. The ground actually isn’t too bad to be honest and although the turnstile system is basic to say the least, you come straight out into the ground which I always liked, opposed to those turnstiles where you then have to climb up 50 trillion stairs. Obviously, being a non-league ground, there are obvious things lacking from this that you would find in a league stadium, the main thing being the lack of segregation between fans, although in honesty, that isn’t too bad. To the left of you when the enter the ground is a large collection of “ever greens” and after you’ve squeezed by that, you come to a fence where all the little cheapskate chavs sit on top of instead of paying to get into the ground. 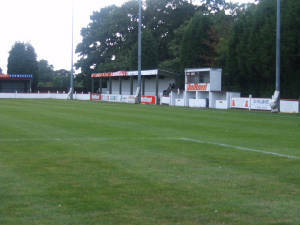 You eventually get to a small seated stand and in all honesty, the view of the action from this stand is very poor. A quick trip around the corner and you get to the world’s biggest terrace, containing a massive two levels, wahey; try not to get a nose bleed. After another quick walk you come to an odd stand which is basically an elevated bench. The final “stand” is basically just a standing error with a net in front of it. 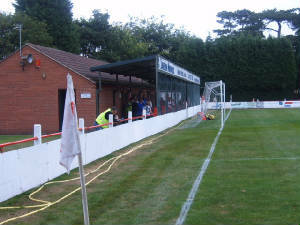 The thing I love about Ashby Avenue is the fact that you can get really close to the action and there isn’t a bad place to stand as everywhere offers a great view of the action. My only concern about the ground is the lack of space around the sides, unusually when I go, it’s quite crowded and considering the standing areas at the side are only a few feet wide and half of that is filled by a body. 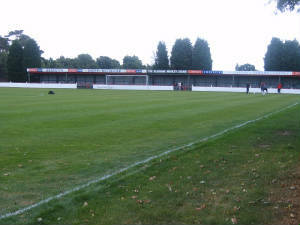 Overall, I actually like Ashby Avenue a lot more than quite a lot of football league grounds, a lot of league grounds have lost that “football” feel to them and now just feel like an empty shell that just happens to have a football match in it. That what makes no-league great because these are how stadiums should be, obviously not in terms of size or standard, but still having that special atmosphere where you can really feel the history of the place.